Sometimes, we need to play iMovie project on Windows (including Windows 8). However, iMovie exported files are often in a format that can not be played on Windows Media Player. In order to play iMovie on Windows PC, we had better find a way to enable iMovie export WMV. The following article will describe an easy solution to export iMovie to WMV: We can not directly save iMovie as WMV, but we can convert the already saved and exported non-WMV iMovie to WMV with iMovie to WMV converter. 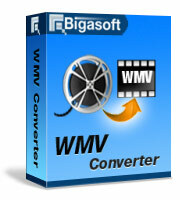 Bigasoft WMV Converter is just the right one. As the professional iMovie to WMV Converter, Bigasoft WMV Converter can easily convert the exported iMovie video whatever it is in MOV, DV, HDV, MPEG-4, M4V, 3GP and etc to WMV format. Then it is just easy to play iMovie on Windows Media Player, PS3, Zune, Zune 2, Archos, Creative Zen, Xbox 360, Dell Players, HP iPAD, Gphone, BlackBerry, and Palm Pre and so on. And it has both Windows version and Mac version; therefore, it is convenient for you to convert iMovie to WMV on Windows (Windows 8 included) or Mac (OS X Mountain Lion included) machine. Moreover, this powerful iMovie to WMV converter also enables to convert iMovie to AVI, MPG, WebM, ASF, FLV, MKV, VOB, RM, MOV, DV and more. Free download the professional iMovie to WMV Converter - Bigasoft WMV Converter (Windows Version, Mac Version), install and launch it. Click "Add File" button to add the already saved iMovie project file. Or you can also drag your iMovie file to the main interface of Bigasoft WMV Converter. Click "Convert" button to finish converting iMovie to WMV format. After finishing the iMovie to WMV conversion, just drag and drop the converted iMovie to Windows Media Player for playing! You can also import this iMovie file to Windows Movie Maker for reediting or playback this iMovie file on WMV friendly portable devices including Xbox 360, PS3, Zune, Zune 2, Archos, Creative Zen and etc.